Digital tattoo inventor Vivalnk is to launch an NFC-based wearable thermometer that adheres to skin and provides accurate temperature measurements directly to a smartphone without requiring a battery. The eSkin Thermometer, on show at the CES in Las Vegas this week, includes NFC chip technology from NXP together with a sensor which takes an accurate body temperature reading in less than three seconds. 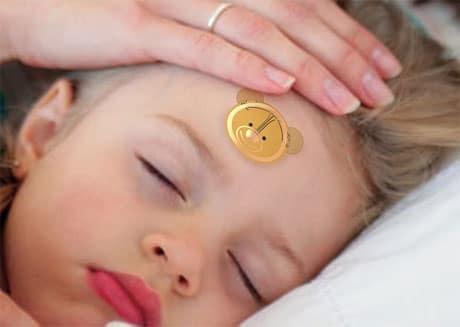 “This thermometer is nothing more than a soft, breathable sticker with a child-approved friendly teddybear design,” the company explains. “The eSkin Thermometer patch works with a smartphone to provide a range of smart feature possibilities. The initial product release will include the ability to record and track fevers.